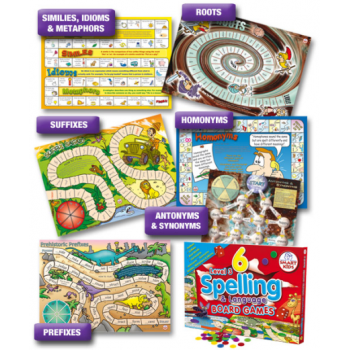 This higher level set of 6 board games teaches more advanced spelling patterns including homonyms, antonyms & synonyms, prefixes, roots, suffixes, and similes, idioms & metaphors. Contains 6 games made from durable cardboard (297 x 420mm), 20 counters, a die, spinners and an answer sheet. Ideal for small groups, these games are suitable for pupils aged 8-11, plus older children with special needs.